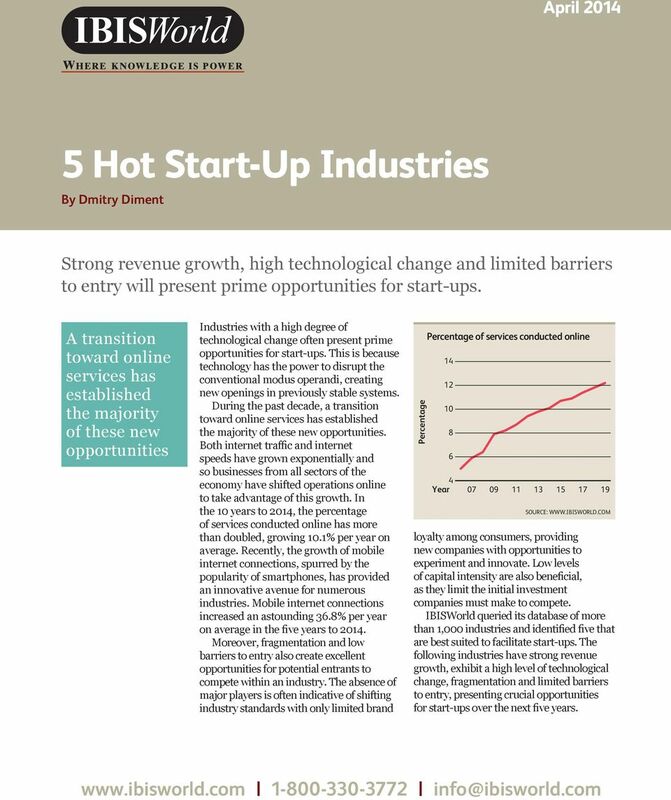 Download "5 Hot Start-Up Industries"
5 At IBISWorld we know that industry intelligence is more than assembling facts. It is combining data with analysis to answer the questions that successful businesses ask. 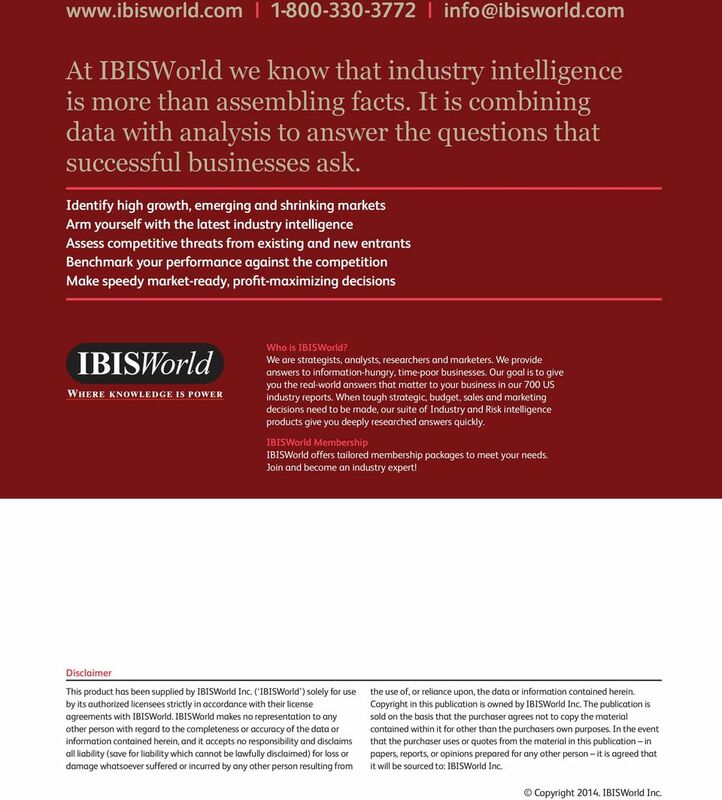 Identify high growth, emerging and shrinking markets Arm yourself with the latest industry intelligence Assess competitive threats from existing and new entrants Benchmark your performance against the competition Make speedy market-ready, profit-maximizing decisions Who is IBISWorld? We are strategists, analysts, researchers and marketers. We provide answers to information-hungry, time-poor businesses. Our goal is to give you the real-world answers that matter to your business in our 700 US industry reports. When tough strategic, budget, sales and marketing decisions need to be made, our suite of Industry and Risk intelligence products give you deeply researched answers quickly. IBISWorld Membership IBISWorld offers tailored membership packages to meet your needs. Join and become an industry expert! Disclaimer This product has been supplied by IBISWorld Inc. ( IBISWorld ) solely for use by its authorized licensees strictly in accordance with their license agreements with IBISWorld. IBISWorld makes no representation to any other person with regard to the completeness or accuracy of the data or information contained herein, and it accepts no responsibility and disclaims all liability (save for liability which cannot be lawfully disclaimed) for loss or damage whatsoever suffered or incurred by any other person resulting from the use of, or reliance upon, the data or information contained herein. Copyright in this publication is owned by IBISWorld Inc. The publication is sold on the basis that the purchaser agrees not to copy the material contained within it for other than the purchasers own purposes. In the event that the purchaser uses or quotes from the material in this publication in papers, reports, or opinions prepared for any other person it is agreed that it will be sourced to: IBISWorld Inc. 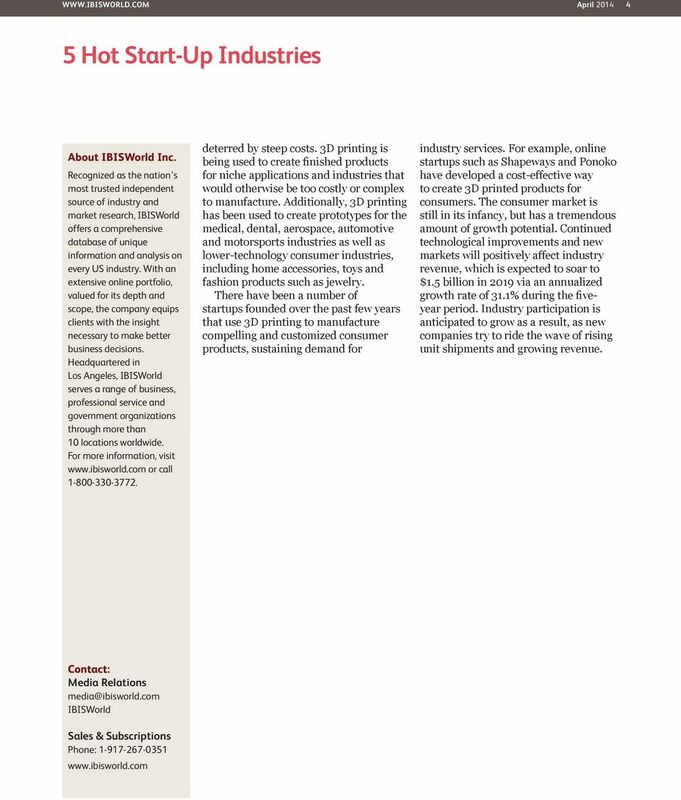 Copyright IBISWorld Inc.
WWW.IBISWORLD.COM February 2013 1 February 2013 By Kevin Boyland and Eben Jose Driven primarily by a shift toward providing services online, these eight industries present excellent opportunities for start-ups. WWW.IBISWORLD.COM April 2013 1 April 2013 By IBISWorld Analysts Douglas Kelly & Anna Son A changing healthcare landscape and increasing demand are spurring potential deal opportunities in related industries. Who Will Lose if Natural Gas Prices Keep Falling? G00270685 Agenda Overview for Digital Commerce, 2015 Published: 18 December 2014 Analyst(s): Jennifer Polk Marketing is making a greater impact on, and taking more responsibility for, digital commerce. Stand on the Sidelines, or Boost Competitiveness? SHUN Live Support. Are Today s Top OrganizationsTurning their Backs on Customers? December 2015 2016 OUTLOOK: GLOBAL PAYMENTS Disruption across the industry a global theme Around the world, new entrants (including start-ups and nontraditional players) are entering the payments industry. White Paper Bridging the Essential Gap between Continuous Quality and Crowd Based Testing 1 Contents Introduction... 3 Testing Lifecycle... 4 Testing typologies... 4 Functional Testing... 4 Manual vs. US Mobile Payments Primed for Growth By Todd Bricker and Shahzad Zia Momentum is building in the US for in-store mobile payments as smartphone ecosystem leaders unveil enhanced mobile payment platforms. Threat Intelligence Pty Ltd info@threatintelligence.com 1300 809 437 Specialist Security Training Catalogue Did you know that the faster you detect a security breach, the lesser the impact to the organisation? Cognizant Mobility Testing Lab. The faster, easier, more cost-effective way to test enterprise mobile apps. Apps Across America. ACT The App Association. 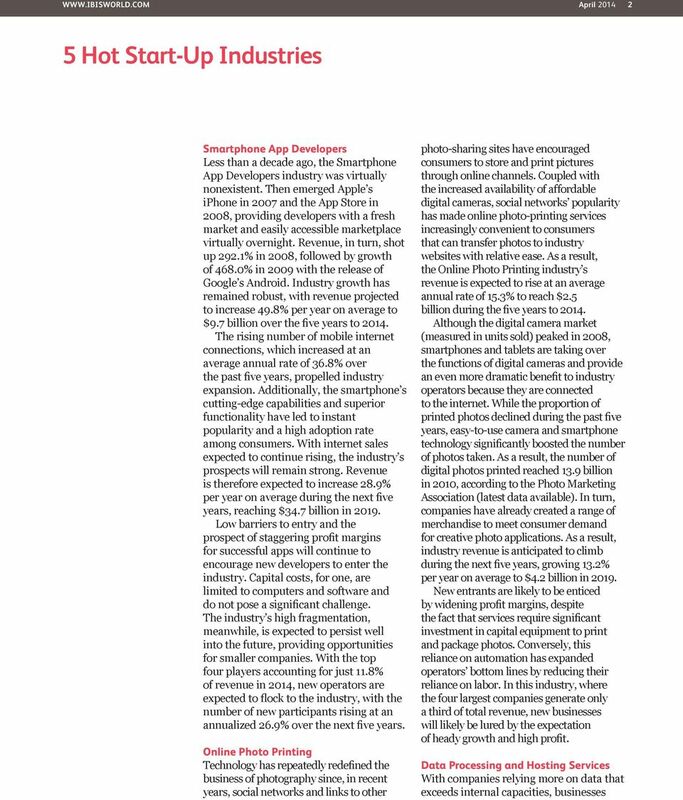 The Economics and Ecosystem of the Mobile App Market. July 18, 2012. 202.331. How big is the mobile app market? John Sheehy Systems Architect 18 Feb 2009 Building a smarter planet with a dynamic infrastructure DYNAMIC INFRASTRUCTURE Helping build a smarter planet 1 2009 IBM Corporation The world is smaller and flatter.